Understanding blue marlin bite behavior and tips to improve your catch rate..
By keeping a log of how every blue marlin hit a lure in the spread, the author was able to determine that the mass majority of fish attack from below the lure, sweeping from the inside of the spread outward toward clean water. Photo by Charlie Levine. 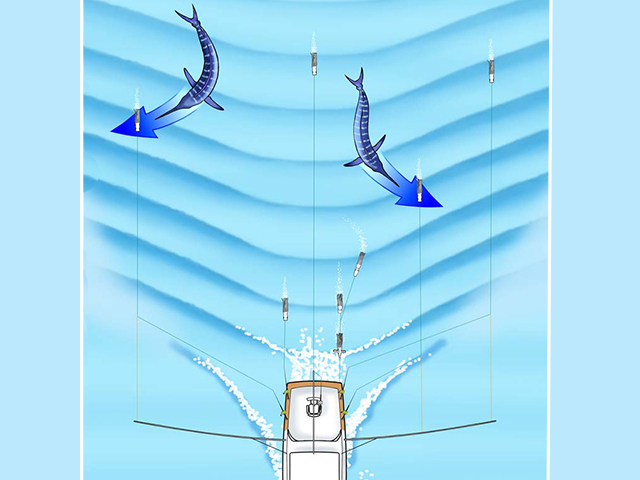 This diagram shows how marlin attack lures fished off of the outriggers and flat lines. The shotgun lure was more randomly hit. To achieve an average catch rate of 80 percent, the author offsets the angle of his hooks by 10 degrees. Courtesy of Steve Campbell. When fishing lures for blue marlin, the majority of the fish are hooked on the side of their mouth. To increase your hook-up rate, offset your hooks so they run at a 10-degree angle toward the propwash, since most blue marlin attack from the inside out. Photo by Charlie Levine. 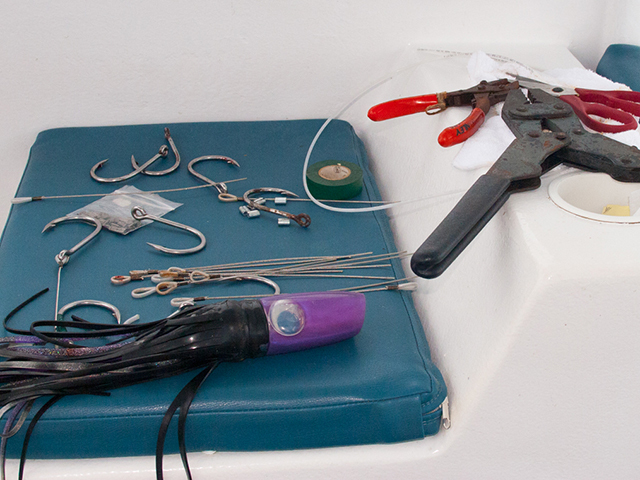 Rigging specific lures for each side of the spread beforehand and labeling them makes it much easier to deploy the spread when you get offshore. Some lures may not run their best with an offset hook angle so you may need to experiment a bit. Photo by Charlie Levine. 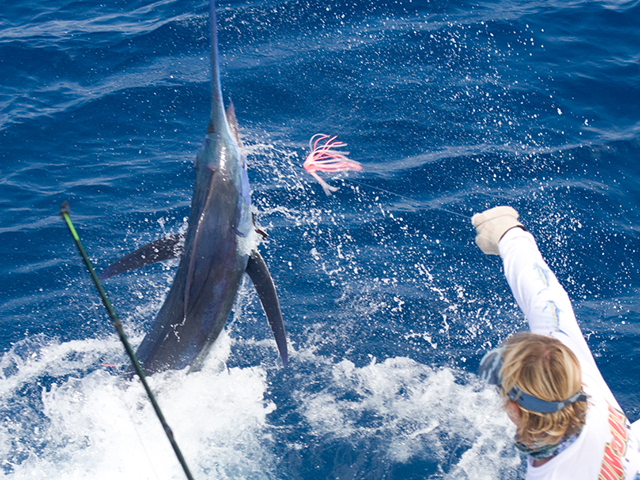 In the heat of the moment as a blue marlin crashes a lure, it is difficult to actually confirm what's happening. Oftentimes all we see is a hole in the water where the lure once was. A screaming reel goes off and a jumping fish rockets out of the ocean -- and this all happens in a matter of seconds. I record strike information on every blue marlin bite and I’ve collected a lot of data to review. I was of the belief that in analyzing the different bite scenarios I should be able to identify some consistent behaviors so I could rig my lures more effectively to match the bite process. 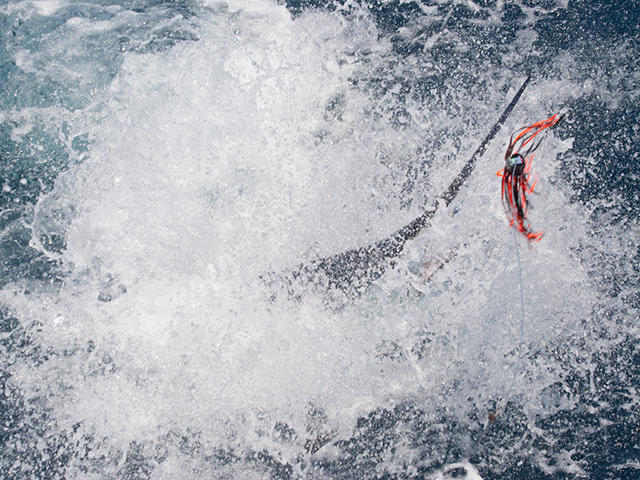 The classic blue marlin crash on a lure always intrigued me. How is it possible that a blue marlin can take a surface popping/plunging lure without physically breaking the surface? When you think about the question, the scenario of approach, strike and exit is a well-rehearsed attack strategy. We confirmed some bite tactics using an underwater camera and personal observation, but it was never clear enough to affirm the critical stages of strike behavior. Blues rarely took a lure from behind. The attack approach was from deeper water, positioning themselves to one side of the lure, slightly rolling their body to perform a sweeping bite action. The slight body roll gives the marlin the ability to increase the arc of a sweeping bite and was an important clue in helping to explain why the body rarely broke the surface. Analyzing detailed strike information finally gave us some pieces of the puzzle and demonstrated there was a high degree of predictable bite behavior. The breakthrough came when looking at where the blue marlin was physically hooked. Mouth hook-ups didn’t actually tell us much because the hook position was somewhat random. It could be embedded anywhere in the mouth but what was important was confirmation that the hook was through the top of the mouth suggesting the initial hook point penetration matched the lure’s upright hook position. When we analyzed non-mouth hook-ups, the penny finally dropped. Blues that took a lure off the starboard side of the spread were always hooked on the starboard side of their head or body and similarly, fish taking a port side lure were hooked on the port side of their head or body. This was absolute evidence that the vast majority of blues approached on the inside of the lure pattern and exited out into clean water regardless of attacking a lure on the starboard or port side. 1. The bill sits between two large, laterally placed eyes and this anatomical feature creates a degree of poor resolution in the marlin’s binocular field of vision, hence the reason why blues have to move off-center and to one side of their prey. Despite this resolution issue, blue marlin are primarily visual predators and have evolved the capability of detecting prey movements and trajectories over a wide spectrum of light levels from the sunlight surface to pitch-black depths. 2. The predictable bite behavior we observed was consistent with lures run out of the riggers and short-corner or long-flat lure positions but not with lures fished off the center rigger. We observed blues hitting the center rigger randomly, approaching from port or starboard -- no doubt related to their initial approach. The center rigger or shotgun lure is the furthermost position from the boat. This lure runs in cleaner, less disturbed water. The strike most certainly has something to do with vision and equally important, an underlying survival instinct. Predators themselves are most vulnerable from attack when they are stalking or launching an attack and being highly evolved predators, I am convinced that blue marlin have the perfect strategy. Before they attack the lure they already have an exit plan. The marlin takes the lure on the inside and escapes out into clean water away from the boat wash. Most lure fisherman running a single-hook lure set the hook to run in the upright position. To match the strike-and-flight behavior, I’d suggest running the hook offset about 10 degrees facing into the wash for both starboard and port lure positions. You will have a better chance of securing a hook-up simply because blues approach from the inside of the pattern, then sweep and bite, exiting out into clean water away from the boat wash. Running twin hook rigs can similarly be rigged to take advantage of the bite behavior. The offset hook is better positioned to initially locate the hook point for subsequent embedment, creating a hook position that best matches the physical strike and bite behavior of the marlin. We tested the theory by actually off-setting the hook the opposite way, facing the hook toward the outside of the wash. The hook-up rate was simply abysmal! This demonstrated beyond reasonable doubt that the strike-and-flight observation had substance. Depending on the lure and or the actual hook-set design, some lures may not run their best with an offset hook angle. Concentrate on those lures that do to achieve a consistent 80 percent strike-to-catch rate. Furthermore, if you use a stiff, single-hook rig, the chance of a clean mouth hook-up is even greater but that is a whole new topic, the details of which will be featured in a future article.